The Kenyan stand-off at Westgate shopping centre enters fourth day with security forces combing the Nairobi mall attacked by suspected al-Shabab militants. An explosion and gunfire were heard at the Westgate complex on Tuesday morning, but later a senior police source said the operation was “over”. At least 65 people have been killed, including three soldiers. Meanwhile, Kenya’s foreign minister said “two or three” Americans and a British woman were among the attackers. In an interview with the US TV programme PBS Newshour, Amina Mohamed said the Americans were 18 or 19 years old, of Somali or Arab origin, and lived “in Minnesota and one other place”. Amina Mohamed said the Briton was a woman who had “done this many times before”. She appeared to contradict earlier comments from Kenya’s interior minister, who suggested that all the attackers were men – though some may have been dressed as women. Amina Mohamed’s remarks have fuelled media speculation about the possible involvement of Samantha Lewthwaite, the widow of one of the men who carried out attacks on London’s transport system on July 7th, 2005. The Somali Islamist al-Shabab movement said it had carried out the attack in retaliation for Kenyan military operations in Somalia. 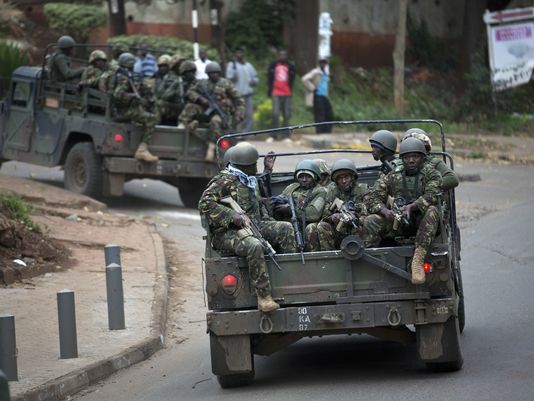 Earlier, a Kenyan officer at the scene said he believed there could be two or three attackers left inside the building. The interior ministry said security officials were in “mop-up operations” and that “we’re very near the end”, while the police said they were cleaning up explosives that had been planted in the area. The ministry said it believed all hostages had been released – though messages on an al-Shabab Twitter feed said hostages were still being held and militants were “holding their ground”. Official sources said that six of the attackers have been killed – three on Monday and three since midnight. Officials said earlier that 10 people had been arrested in connection with the attack. Between 12 and 15 militants stormed the Westgate centre on Saturday, throwing grenades and firing on shoppers and staff. At least 18 foreigners are among the dead, including six Britons, as well as citizens from France, Canada, the Netherlands, Australia, Peru, India, Ghana, South Africa and China. The interior ministry said on Tuesday that three soldiers had succumbed to their injuries, and eight were still being treated. “We’ve lost three heroes,” the ministry said on its Twitter account. Nearly 200 people were wounded, including five Americans. The Kenyan Red Cross said 51 people remained unaccounted for. President Barack Obama called the attack a “terrible outrage” and said the US was providing all the co-operation it could to Kenya. Thousands of Kenyans have been responding to appeals for blood donations. Al-Shabab, which is linked to al-Qaeda, has repeatedly threatened attacks on Kenyan soil if Nairobi did not pull its troops out of Somalia. There are about 4,000 Kenyan troops in the south of Somalia as part of an African Union force supporting Somali government forces. Al-Shabab is fighting to create an Islamic state in Somalia. Despite being pushed out of key cities in the past two years, it remains in control of smaller towns and large swathes of the countryside. UN special representative for Somalia Nicholas Kay called on Tuesday for a fresh surge in African troops to Somalia to counter an estimated 5,000 al-Shabab fighters, Reuters news agency reported.